Ashtabuja Perumal Temple is located at Pillayarpalayam near Kanchipuram, 1.5 km west of the Varadaraja Perumal Temple. It is one of the 108 holy places of Vaishnavites. The presiding deity is Adikesava Perumal along with his consort Alamelumangai. The Perumal in this sthalam is Aadhikesava Perumal and he is seen with 8 hands. He holds Chakaram, Sword, a Flower and an Arrow on the 4 right hands and Sangu, Bow, Kedayam (which is used to protect while fighting using a sword) and Gadha (Which can be found along with Hanuman and Bhima). 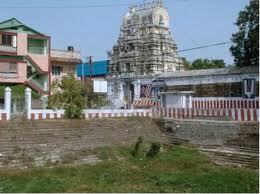 The temple occupies an area of one acre with a three-tiered Rajagopuram in the northern side. The temple tank is known as Gajendra Pushkarani. The temple holds separate shrines for Bhuvaraahar, Aandaal, Peyalwar and Hanuman. The deity in the shrine has got eight hands which is something super natural. Lord Vishnu is portrayed in a standing posture, facing the Western side. This is a very old temple and tourists can find many stone carvings in this temple. The sthalapuranam of this temple is also associated with that of Saraswathi and Lord Brahman. After all the demons were killed by Sriman Narayanan, who were sent by Saraswathi to destroy the yagam done by Brahma devan, she finaly sent a ferocious Sarbham (snake). Sriman Narayanan to kill the dangerous snake, took the form of Ashtabhuja Perumal holding 8 different weapons to kill the snake. And using all those 8 weapons, he killed the snake sent by Saraswathi. The snake is found on the Vaayu end of the yaaga sala as “Sarabeswaran” in this temple. The main festivals celebrated are Bhramotsavam in the month of Chittirai (April-May), and Gajendramoksham in Aadi (July-August). This is a very old temple and tourists can find many stone carvings in this temple.